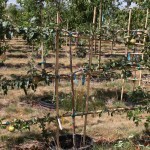 Six varieties of fruiting apples trained in a horizontal espalier. The varieties are: Braeburn, Honeycrisp, Fuji, Gala, Granny Smith, and Golden Delicious. It may be planted against a wall or fence, or otherwise supported into a fruiting fence. It needs full sun to part shade, a well-drained soil, and regular pruning to maintain form and increase fruit production. Grown on semi-dwarf rootstock.